This is the default category. If I forget to file it, it shows up here. I gave this presentation, “How to Node Chat”, at the 9/22 meetup of Dallas.Node. 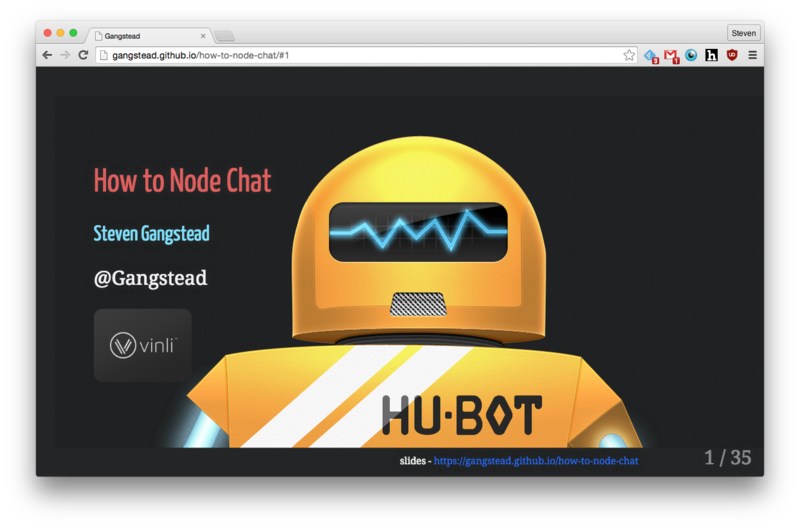 In it I cover a little bit of history and internals of Hubot chat bot open sourced by Github. Then I demonstrate how to make your own and connect it to Slack and Gitter and how to deploy it to Heroku. The world of code is filled with acronyms. K is modeled on another language called APL, which stands for A Programming Language. Programmers are funny, like your uncle. They hold the self-referential and recursive in the highest regard. Another classic: GNU, which means GNU’s Not Unix. Programmer jokes make you laugh and sigh at once. Or just sigh. Here’s a presentation I made recently (4/9/2015) for the Dallas Scala Enthusiasts meetup group. 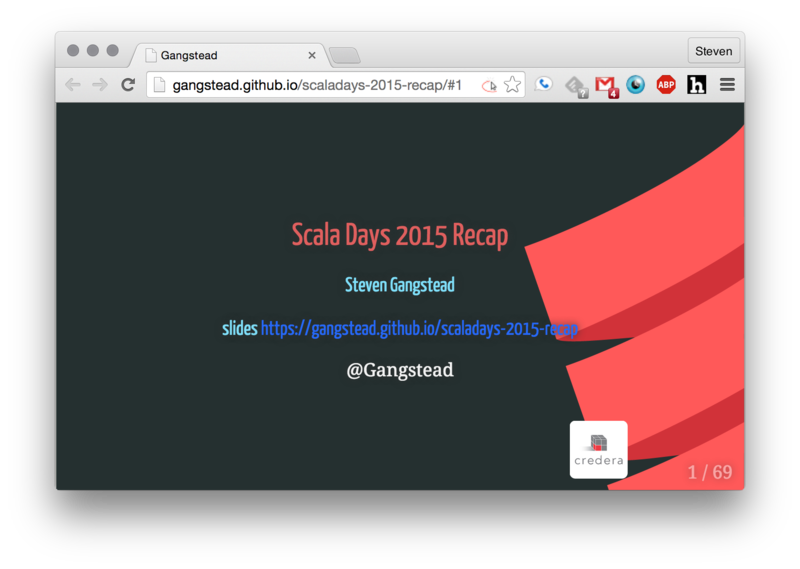 I attended Scala Days 2015 in San Francisco and presented the notes I took while there. A note on my presentation style: This is the second presentation I’ve made using Remark.js and hosted on Github Pages and I plan to keep using this setup going forward. I’ve found this to be a quick way to put a presentation together and easily host and distribute it. I’m happy with the tradeoffs of making a decent looking presentation very fast with all of my content in markdown. Also, if there’s demo code (like there was last time), I can keep the code and the presentation in one location. I fixed some issues with my Scala-Format package for the Atom editor. Please upgrade to 0.1.4. Atom updated their API and removed some of the methods I was using, so I had to do some minor refactoring.